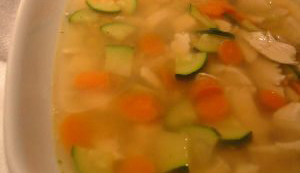 Enjoy this winter warming soup full of nutritious veggies. Be creative and add your own favorite spices and vegetables. 1. Remove chicken breasts and legs and set aside for later use. 2. Remove skin from chicken carcass and place into a stockpot along with the carrots, celery, onions, parsley, salt, pepper and herbs. 3. Cover with cold water and bring to a boil and then let simmer for 1 hour. 1. Return strained broth to the stove and then add wild rice. 2. Cook 30 minutes at medium boil. Add in carrots, celery, zucchini and other vegetables. 3. Simmer, partially covered, stirring occasionally, until vegetables are cooked about 15-20 min. 4. Stir in shredded chicken and serve.